The first steps toward the 2018 Winter Olympics will be taken in early December at Encana Arena in Camrose, Alta., and a who’s-who of Canadian curling will be on hand. The 2014 Canada Cup of Curling, presented by Meridian Manufacturing, scheduled for Dec. 3-7, will not only feature both defending Olympic gold-medal teams (Brad Jacobs of Sault Ste. Marie, Ont., Jennifer Jones of Winnipeg), it will feature the reigning champions of the Tim Hortons Brier (the former Kevin Koe team of Calgary, now skipped by John Morris) and Scotties Tournament of Hearts (Rachel Homan of Ottawa), in addition to giving curling fans a peek at some intriguing new lineups that are starting down the road to the 2017 Tim Hortons Roar of the Rings Canadian Curling Trials and the 2018 Winter Olympics in Pyeongchang, South Korea. A total of 14 teams (seven men’s, seven women’s) will be in Camrose, playing for their share of the $140,000 purse ($14,000 to each winning team, $9,000 to second place, $5,000 to third, and $2,000 for each round-robin win), in addition to the berths in the 2015 World Financial Group Continental Cup (Jan. 8-11 in Calgary), the 2015 Canada Cup of Curling (Dec. 2-6, location TBD) and the 2017 Road to the Roar Pre-Trials (dates and location TBD). The Olympic, Brier and Scotties champs will face stiff tests in Camrose. 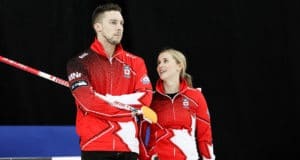 On the men’s side, Jacobs and Morris will be challenged by new teams skipped by Koe and four-time world champ Glenn Howard. Koe’s new team from Calgary features third Marc Kennedy and lead Ben Hebert, both of whom won gold with Kevin Martin in 2010 in Vancouver, and second Brent Laing, who won two world titles playing with Howard. Howard, meanwhile, shuffled his Penetanguishene, Ont., lineup in the off-season with the departures of Laing and third Wayne Middaugh (retirement). 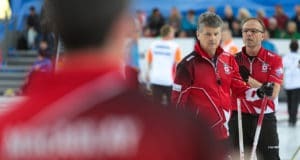 His new lineup features the return of Richard Hart to vice-skip (the two combined to win the 2007 world title) and Jon Mead at second; Mead was a member of the Jeff Stoughton team that won the most recent Canada Cup men’s title in 2012 in Moose Jaw, Sask. The men’s field is rounded out by Jim Cotter of Vernon, B.C. (the runner-up team, with Morris skipping, at the 2014 Tim Hortons Brier), 2006 Olympic gold-medallist Brad Gushue of St. John’s (with former third Mark Nichols returning to the lineup) and Mike McEwen of Winnipeg. 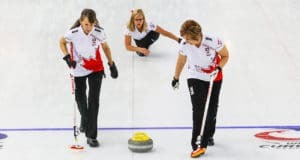 The women’s field will feature six of the teams that were in the final stage of qualifying for the 2014 Winter Olympics, including Tim Hortons Roar of the Rings champ Jones and runner-up Sherry Middaugh of Coldwater, Ont. As well, Scotties runner-up Val Sweeting of Edmonton (with seven-time New Brunswick women’s champ Andrea Crawford moving in at third) is entered, as is 2012 Scotties champ Heather Nedohin (with new third Amy Nixon) of Sherwood Park, Alta. The women’s field is rounded out by three-time Canada Cup champ Stefanie Lawton of Saskatoon, and 2014 Ontario women’s champion Allison Flaxey of Listowel. The teams will play a single round-robin draw, with the top three teams advancing to the playoffs. The first-place team in the round-robin will advance directly to the championship final, while the second- and third-place teams will meet in the semifinal. Click here for the complete list of teams, and click here to purchase tickets for the 2014 Canada Cup of Curling.